"The Father of American Landscape Painting"
Physical Health - He suffered from epilepsy since childhood. George Inness received no formal education in art but traveled many times to Europe. While in France, Italy and England he met many influential painters and gleaned a wealth of knowledge which influenced the style of his work. According to his biographer, Mary Schell Hoke Bacon, "He was forty years old before he got to Paris, but once there, he turned to the men at Barbizon--Rousseau, Millet, Corot, and the rest--for inspiration, and began to do beautiful things indeed. Rousseau became his friend, and the art of Inness grew large and rich through such influences." He is best known for his later works, landscapes influenced by the ideas of Swedish philosopher Emanuel Swedenborg. The philosopher wrote that "For the spiritual sense of the Word treats everywhere of the spiritual world, that is, of the state of the church in the heavens, as well as in the earth; hence the Word is spiritual and Divine." George Inness's landscape paintings changed from his more realistic Hudson River period to a luscious and luminous style with evocative atmospheric effects featuring misty backgrounds illuminated by moonlight. Inness asserted "The purpose of the painter is simply to reproduce in other minds the impression which a scene has made upon him. A work of art does not appeal to the intellect. It does not appeal to the moral sense. Its aim is to instruct, not to edify, but to awaken an emotion." Tonalism is rooted in the French Barbizon movement, which emphasized atmosphere and shadow. 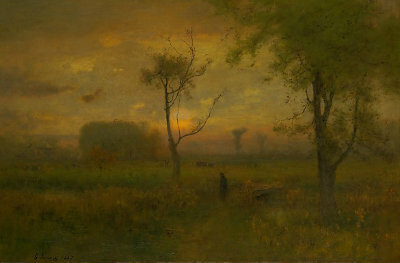 The Tonalist style employs a distinctive technique by the use of color's middle values as opposed to stronger contrast and high chroma. Resulting in a understated and compelling overall effect. The tonalist subject matter is never entirely apparent; their is no effort to communicate a message or narrate a story. Instead of relating a story, each sensitively chosen color, composition, and line is arranged to create an intriguing visual poem. The interiors of tonalist paintings are generally elegant and sparsely decorated, tonally uniform, simplified and indistinct; the figures are usually presented alone in silent contemplation. Landscapes are typically luscious and luminous with evocative atmospheric effects featuring misty backgrounds illuminated by moonlight. Tonalists painters were drawn to both the natural and spiritual realms. They sought to awaken the viewers consciousness by shrouding the subject in a misty indistinct veil of emotionalism. The palette is minimal, characterized by warm hues of brown, soft greens, gauzy yellows and muted grays. Preferred themes were evocative moonlight nights and poetic, vaporous landscapes. Tonalist painters seemed to favored unconscious states and psychological experiences over reality.